Formerly known as the Most Haunted House in America, the home of carpetbagger Charles Wright Congelier, his wife Lyda, and a young servant girl, Essie, was located at 1129 Ridge Avenue, in the Manchester North Side neighborhood of Pittsburgh. The story of its life as a haunted house begins in the winter of 1871, with Lyda's discovery of Charles having an affair with the maid. Lyda was so enraged, that she killed Charles and Essie. For the next 20 years, the house remained vacant. It was remodeled to accommodate railroad workers in 1892, but they soon moved out, claiming to hear the sobbing and screaming of a woman. The Most Haunted House in America once again stood ​vacant. Around 1900, Dr. Adolph C. Brunrichter bought the home. "Keeping to himself, the doctor was rarely seen by his neighbors. Then on August 12, 1901, the family next door heard a terrifying scream from the Brunrichter residence," wrote Richard Winer and Nancy Osborn in their book, "Haunted Houses." "When they ran outside to investigate, the neighbors saw a red explosion-like flash shooting through the house. The earth under them trembled, and the sidewalls cracked. Every window in the doctor's home was shattered." When officials entered the house to investigate, they found a decomposed female body strapped to the bed and five headless young women in basement graves. "Dr. Brunrichter had been experimenting with severed heads," wrote Winer and Osborn. "Apparently, he had been able to keep some alive for short periods after decapitation." Dr. Brunrichter, meanwhile, had disappeared, and the house once again stood vacant. As a result of its reputation for being haunted, the house stood empty for several years before undergoing its second remodeling to ready it for housing emigrant Equitable Gas Company workers. These workers experienced many strange occurrences but wrote them off as pranks by the American workers they had replaced (for lower wages). One night things took a tragic turn, however, and two of the workers were found dead in the basement. These men had both been seen alive just minutes earlier. In 1920, the famous scientist and inventor, Thomas Edison, came to study the house. Edison spoke of a machine that he was building to allow communication with the dead. Edison died before the mechanism was perfected. Winer and Osborn wrote that Thomas Edison's visit to the house at 1129 Ridge Avenue apparently influenced his strong belief in the afterlife. In September of 1927, a drunk was arrested who claimed to be Dr. Adolph Brunrichter. He told police gruesome stories of what had occurred in the house. The authorities could not determine if the man they had in custody was indeed Dr. Brunrichter. The man was released after a month and was never seen again. Days were numbered for the haunted house which everyone was convinced was evil. Nearby, on the site that is now the Carnegie Science Center, stood the largest natural gas storage facility in the world. On the morning of November 15, 1927, the giant gas storage tank owned by the Equitable Gas Company exploded with an awesome force which was felt across the county. 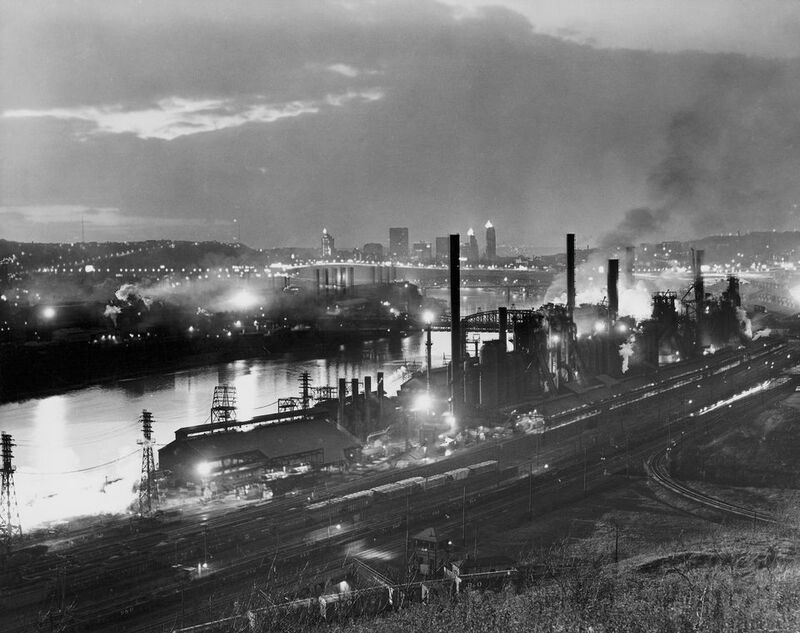 "The Story of Old Allegheny City," compiled by workers of the Writers' Program of the Works Projects Administration, describes the destruction. "As houses collapsed and chimneys toppled, brick, broken glass, twisted pieces of steel and other debris rained on the heads of the dazed and shaken residents who had rushed into the streets from their wrecked homes, believing that an earthquake had visited the city." The force was so strong it reportedly blew out windows throughout downtown, Mt. Washington, and as far away as East Liberty. Dozens of manufacturing plants and hundreds of homes were damaged or destroyed within a 20-mile radius. The Most Haunted House in America, which once stood at the present day site of the Route 65/I279 interchange, was obliterated in the explosion. According to Winer and Osborn, it was the only structure destroyed in the blast for which no trace was ever found. * The above ghost story is just that - most likely a story. Born partially of truth, but the vast majority appears to be fictional in nature. Perhaps the house really was evil, however. While the house was damaged, not completely obliterated, in that Equitable Gas explosion, Marie Congelier, age 28, died that day according to newspaper reports. She was hit by flying glass and died on the way to the hospital. Even if the rest of the Original Most Haunted House in America tale isn't true, I wouldn't blame her for haunting the area!